I will never forget this past weekend attending the Miss Universe 2015 pageant in Doral, Miami. It was seriously so much fun watching not one, but TWO of my friends compete!! 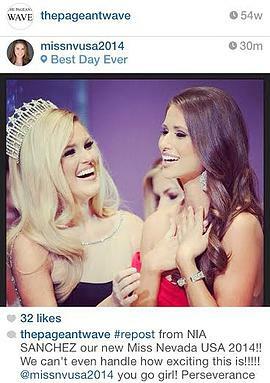 One of my very best friends Nia Sanchez (Miss USA 2014) nearly won the whole thing placing 1st runner up! It was incredible to watch her on stage that night and it has been even more incredible watching her in her overall journey. 1.) Never give up! – Nia never gave up on her dream to go to Miss USA. As a result, she ended up on the stage at Miss Universe! Imagine if she had quit with the first “not yet” she received or surrendered to any discouragement that came her way. Chelsea Caswell celebrates with Nia on stage at the Miss Nevada USA 2014 pageant moments after Nia is announced as her successor. The night Nia was crowned as Miss Nevada USA 2014! It was only the beginning! When my girlfriends and I sat in the audience on the night she was crowned Miss Nevada USA, it was tears galore. So many emotions were overflowing that night and I’ll never forget the look on her face when we all ran onto the stage to hug her. Deep in my heart, I knew it was only the beginning for her. Great things happen for people who persevere through all the doubts, insecurities, obstacles and naysayers. 2.) Always be thankful and humble/ Never change – So just to recap: Nia won Miss Nevada USA in January 2014, won Miss USA in June 2014, got engaged to the love of her life Daniel Booko in October 2014 and placed first runner up at Miss Universe in January 2015. 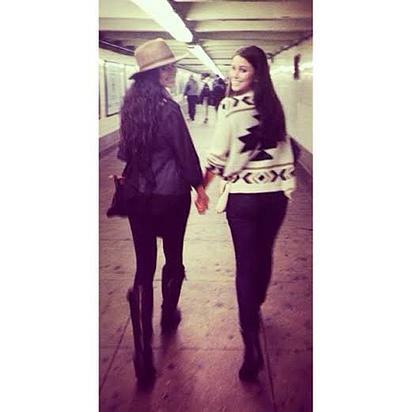 As Miss USA, Nia has such an insanely busy schedule, especially in preparing for the Miss Universe pageant. On top of all the pageant prep, she also has a schedule jam-packed with photo shoots, appearances, charity events and so much more. Despite all the cameras flashing and opportunities coming her way, Nia has remained just as humble as ever. She’s still the same Nia I met years ago. She’s still incredibly thoughtful and sincere and puts so much effort into making others feel happy. Immediately after the Miss Universe pageant, Nia wanted to go out to eat at BJ’s Brewhouse (priorities people!! ), but unfortunately it closed at midnight. When we got there five minutes before they closed, the restaurant welcomed Nia and her friends and family in for an additional two hours after closing to the public. Nia was so thankful of course, that despite being incredibly tired, I found her sitting in a booth signing autographs and thank you notes to the entire staff who stayed late to serve us- and that’s the type of girl Nia is: humble and gracious. This was only an hour or so after coming off a nationally televised pageant where she was front and center! Yet, there she was, thinking of others and wanting to make people happy. I will never forget that about her. She hasn’t let the attention and glamour change her heart. She’s a real inner beauty queen! Nia aced every portion of the competition. She was flawless. Truly glowing from the inside out! 3.) Trust in God’s timing. – When I think of Nia, I think of the scripture Esther 4:14 “And who knows but that you have come into your royal position for such a time as this?” Nia literally waited and waited until it was finally her turn to come into her position as a titleholder. The timing was so perfect because look at all that’s happened in her life under HIS timing. It’s stunning! Sometimes in life we think we know what’s best for us. We want what we want and we want it right away. When we don’t get the things we want in our timing, we grow weary and frustrated. I’ve learned to trust in God’s timing over my own because His plans for me are so much bigger and better than my own hopes and dreams. God clearly had a major plan in his timing for Nia’s amazing journey and it really taught me to fully surrender to God’s timing with all my heart. This is why when Nia wasn’t crowned as Miss Universe on Sunday night, we knew it was setting her up for something even bigger. “Blessed is the one who perseveres under trial because, having stood the test, that person will receive the crown of life that the Lord has promised to those who love him.” James 1:12– and that’s the kind of crown a girl like Nia fights for every day. Congratulations Nia Sanchez, Miss USA 2014 and 1RU Miss Universe! Your reign as a titleholder may only last for a year, but the legacy you are creating and leaving behind will last forever and ever. And THAT is what I call a QUEEN.